In London, there was a place you probably never heard of called "Fridge Mountain" where refrigerators went to die. 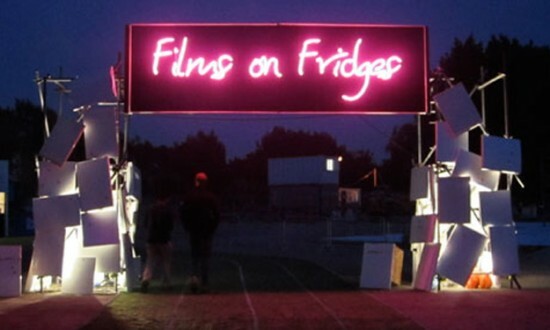 As you can imagine from the name, there were a lot of refrigerators there, and with that wealth of building material and a relatively wacky idea, Films on Fridges was born. When the dumping ground was being cleaned up for the 2012 London Olympics, the volunteers decided that perhaps they could build a theater because, you know, it would be cool. It's only a temporary installation, but movies are being shown there right now. If you're lucky enough to be in London, it might be worth checking out. If you aren't, see if the nearest grocery store will let you set up a TV in their dairy cooler or something. Check out a bunch of pictures of a bunch of fridges below.